The best way to dress up any room or apartment you’re moving into is always to add some DIY magic. Sure, you might get the essentials at Ikea, but you should definitely make a pit stop at your local craft supply store and make something for yourself. This fox rug is one of those must do designs. If you love crafts, foxes, or soft textiles, nothing will be more adorable or chic in your space than this. 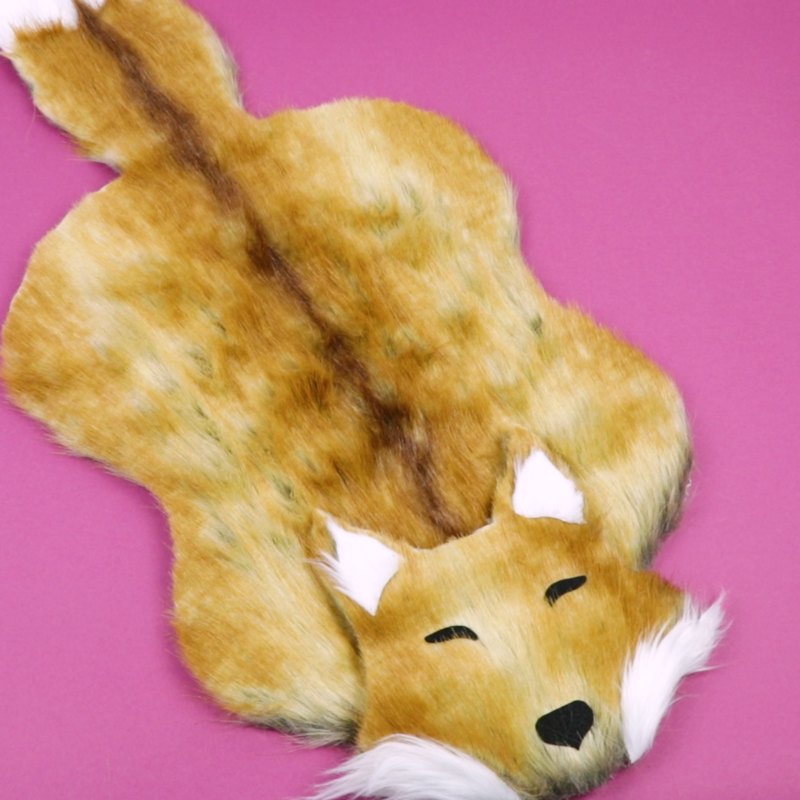 Your fox rug will be a staple of conversation and, even when you’re alone, snuggling up with this will always keep you company. Follow the video instructions below and let us know how it turns out. 1. Using a marker, sketch out a fox shape on the rug canvas. When you are happy with one side of the design, cut it out, fold the canvas in half, and trace it on the other side, so the fox shape is symmetrical. Cut out the other side. 2. Flip the brown fur over to the non-furry side. Using the rug canvas as a stencil, trace the shape with a marker onto the brown fur and cut it out. 3. With the brown fur still flipped over to the non-furry side, hot glue the rug canvas to the brown fur around the edges. 4. Cut out a tail tip from the white fur and hot glue it on. 5. Cut a fox head out of brown fur. 6. Cut eyes and a nose out of the black felt and hot glue them on. 7. Cut out inner ears and cheeks from the white fur. 8. Hot glue the inner ears and cheeks to the head. 9. Hot glue the head to the fox body.